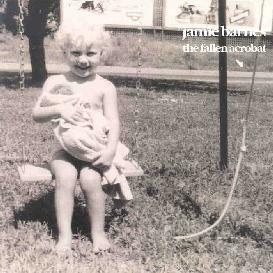 Jamie Barnes - "The Fallen Acrobat"
Well here's something different from the Silber label. Jamie Barnes is a singer-songwriter from Kentucky who plays.... SONGS! Yup, just really nice heartfelt songs. I guess at the core I'd call him a folk singer. He's got a nice singing voice and his melodies are simple yet captivating. Jamie uses mostly acoustic guitar to create the music, but also employs piano, bells and more to embellish and color his sound. I thought the toy piano interludes on a few tracks were a nice touch that add a spark of innocence to the music. The promo sheet compares Jamie to Nick Drake, among other artists I've not heard of, though I'd say Jamie is much more upbeat and positive than anything I recall hearing from Nick Drake. A bit brooding at times so sure, I guess I'll go with the Drake analogy. I even detect hints of psychedelia at times. (My wife called out from the living room asking what I was listening to and said it sounded to her like Simon & Garfunkle.) So if you like well crafted acoustic tunes sung with passion and with well written lyrics, then you will more than likely enjoy what Jamie Barnes has to offer. Contact via snail mail c/o Silber Records; PO Box 27619; Raleigh, NC 27619.